All. I can't find one bad thing about this speaker. none that I have found. I have the series two center not the series one. I think this speaker is killer. 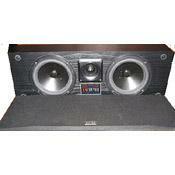 I got this speaker and a pair of kx-6 series two surround speakers for 75 dollars at a local pawn shop. I saw this set for that cheap and I bought it in a hurry. This speaker is absolutely amazing. I can't stand the satellite speakers of today, so when I saw this, I was stoked. The highs are just right and the mids are full and alive. The bass response is awesome too for two 6" speakers. I have an internal x-over on my harman kardon reciever and I have the high pass set to 60hz and it performs phenominal. I am a die hard dcm fan and would recommend this speaker to anyone. Find one, buy one, enjoy it for life. Tigh and relatively low bass response. Easily mates with large floor-standers. This may be too large for some; now that the micro sattelites are so popular. Have been using this speaker for many years (10+) now and cannot say anything bad about it. It is a BIG sounding speaker due to the horn loading of the tweeter. The bass is substantial considering it is a sealed enclosure. This speaker has a very tight and revealing bass response. I currently drive it with a HK AVR25mkII receiver.